Καλοτοποθετημένο στη ψώνια, νυχτερινή διασκέδαση, εστιατόρια περιοχή της Οζάκα πόλης, το Ookini Hotels Nipponbashi Apartment είναι το κατάλληλο μέρος για να χαλαρώσετε από τις πολυάσχολες μέρες σας. Από εδώ, οι επισκέπτες μπορούν να έχουν άμεση πρόσβαση σε όλα όσα η πόλη έχει να προσφέρει. Με την βολική του τοποθεσία, το ξενοδοχείο προσφέρει εύκολη πρόσβαση στους προορισμούς της πόλης που πρέπει οπωσδήποτε να δείτε. Το Ookini Hotels Nipponbashi Apartment προσφέρει επίσης πολλές εγκαταστάσεις για να εμπλουτίσετε την διαμονή σας στη Οζάκα. Το ξενοδοχείο σας προσφέρει μια μεγάλη επιλογή υπηρεσιών, συμπεριλαμβανομένων των ιδιωτικό τσεκ ιν/τσεκ άουτ, ενοικίαση φορητού wi-fi, δωρεάν WiFi σε όλα τα δωμάτια, ανελκυστήρας. Το Ookini Hotels Nipponbashi Apartment διαθέτει 7 δωμάτια. Όλα τους είναι διακοσμημένα με γούστο και πολλά από αυτά παρέχουν ανέσεις όπως επίπεδη τηλεόραση, προϊόντα καθαρισμού, κρεμάστρα ρούχων, δωρεάν καφές φίλτρου, λευκά είδη. Εξάλλου, το ξενοδοχείο διοργανώνει πολλά ψυχαγωγικά δρώμενα έτσι ώστε να έχετε πολλά πράγματα να κάνετε κατά τη διαμονή σας. Όποιος κι αν είναι ο σκοπός της επίσκεψης σας, το Ookini Hotels Nipponbashi Apartment είναι μια εξαιρετική επιλογή για την διαμονή σας στη Οζάκα. Θα βρείτε ειδικές οδηγίες για το check-in συνημμένες στο email επιβεβαίωσής σας μετά την πραγματοποίηση της κράτησης. Παρακαλούμε ακολουθήστε τις οδηγίες για να διασφαλίσετε την ομαλή διεξαγωγή του check-in. Σε αυτήν την ιδιοκτησία απαγορεύεται αυστηρά το κάπνισμα. Οι επισκέπτες φέρουν την ευθύνη για οποιαδήποτε δαπάνη, καταστροφή και υποχρέωση προκύπτει λόγω καπνίσματος. Οι επισκέπτες πρέπει να βγάζουν τα παπούτσια τους κατά την είσοδό τους στην ιδιοκτησία. Το check-in ή το check-out εκτός των ωρών που αναφέρονται ενδέχεται να υπόκειται σε πρόσθετη χρέωση. Η ιδιοκτησία δεν παρέχει υπηρεσία καθαριότητας. We loved to stay this hotel / apartment. However, it was a bit cold to sleep during night. We could not complain at all because of the location speaks for all. I would definitely stay here again if I visit Osaka. It's right next to the subway station and it's a walking distance from Dotonbori, so it's very easy to move around. The staff was kind, like all the other people I met in Japan, and the rooms we stayed in were both very spacious and clean. They had practically everything we needed including free coffee and snacks, water, hair dryer, etc. And most importantly, they kept our luggage before check-in and after check-out. Overall, I would recommend this place for anyone traveling to Osaka on a budget and especially for those traveling in big groups. It was our 1st time in Osaka and I was very glad to have chosen to stay in this hotel. It met all our needs...1 minute walk to nipponbashi station, 7-11 and Family Mart, Dotonbori, Shinshaibashi and Kurumon Market was less than 5-minute walk. The rooms are spacious and clean. I encountered a problem with our Agoda booking but Ookini's staff extended extra effort and stayed extra hours at work to help us out. She did not leave until the problem was resolved. I think she went over and beyond her duties to make sure that we were checked in properly. 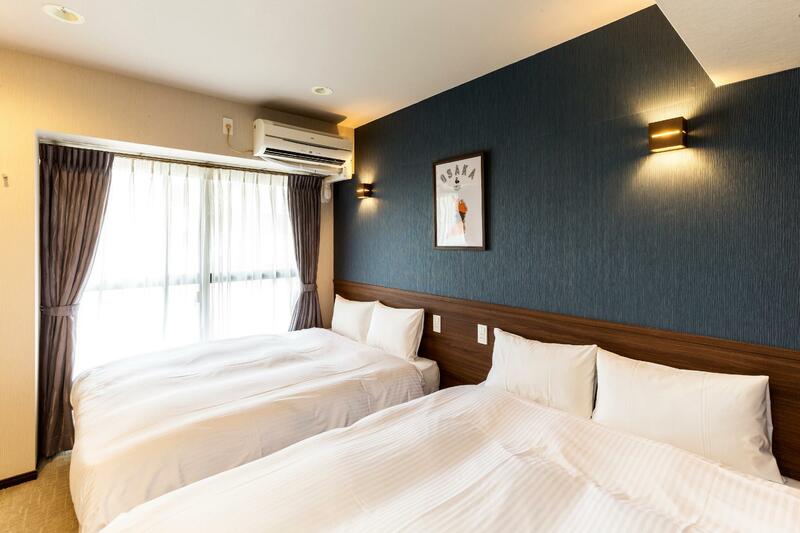 Location is perfect - there are 4 stations that are a few steps away, Dotonbori is a comfortable walking distance, Kurumon market is very near as well. There is a 7/11 and FamilyMart a few steps from the property. I would definitely stay at this property again when we travel to Osaka. 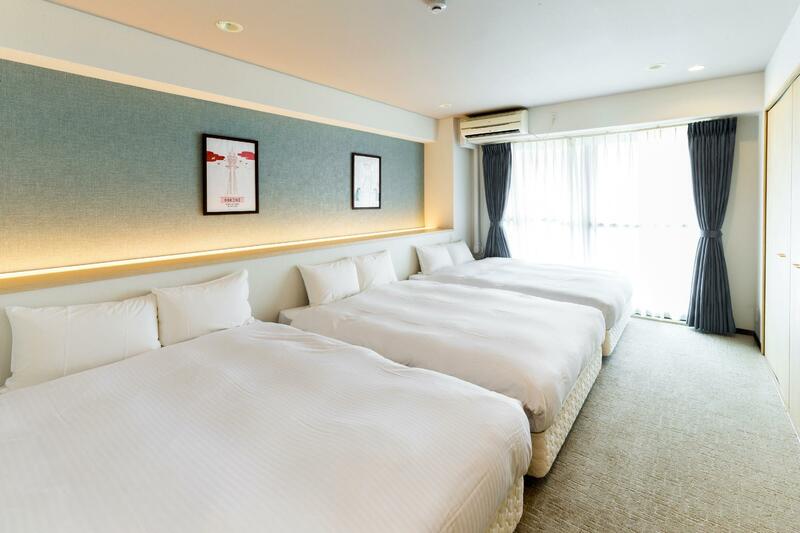 Good location (close to rail station), place is big for Japan standards with decent rates. It’s also great that you are able to cook as there is a small kitchen with all the amenities. Excellent A+ stay (total 5 days). Most definitely would recommend and stay again. Location is seconds away from nippombashi subway station, and a few blocks away from Kuromon Market and Dotonburi. Old building but adequate amenities. Washer/dryer is a plus point. Their customer service also responds quickly to our questions via agoda inbox. Ookini hotel is convenient to the train station and the Shinsaibashi. The room has an open kitchen with simple utensil, which allows visitors to cook simple meal. The rooms are tidy and neat. one thing that's lacking is that you can't send your luggages ahead of time or storing the luggages after check out (10 am in the morning), with the price of regular hotels with checking in service. the solution is for guests to pick up their luggages from Yamato storage store nearby. Otherwise, nice stay. CS communication through email is responsive and they are very helpful and accommodating. Comfy stay. Next if budget allowing, will come back. This is a great place to stay at. The facilities were exceptional. Its is near to doutonburi street and walking distance to the nearest Subway station. However there is no staff on standby, our auto door lock had problems locking. But overall its still a pleasant stay. Will choose to stay here again the next time I visit. Thanks. this is a no reception and no service apartment hotel. we stayed 3 nights there without change of towels and cleaning. though I have asked the hotel to provide extra towels by email before checked it but nothing happened. our bedroom window was facing a construction that started extremely noisy from 9 am. We stayed for a week at the hotel which was a great decision! The location is very strategic, just less than 10mins walk to Dotonburi and only a few steps to Nippombashi Station. We just have a bit of problem with the complimentary portable wifi which is not working usually in the afternoon until night time. But wifi in the hotel is good. Overall the hotel and the location was awesome! Highly recommended! Great location, right next to Nippombashi subway station （地下鐵日本橋站）Exit 6, and convenience stores and restaurants are situated there as well. Shampoo+Conditioner+Shower (Liquid) Soap are provided, and 2 bottles of water are also complimentary. In-Room wifi is strong and stable. FREE pocket wi-fi is also offered for use when going out. Customer Service Team did all the communication thro' email, everything is clearly mentioned. The room is spacious, it is like a "straight line" (Door -> Toilet + Bathroom -> Dining Room with a 4-seater table -> long aisle with wardrobes -> bedroom). Just one thing, we found that we felt a bit "itchy" when sleeping in bed and staying at the dining room area with carpet. Spacious place that is very accessible. Just beside the station. Staff were really helpful and the room has all the amenities that you would need. Very convenient as it's only 1 min away from an subway Station. Good apartment, clean, and fully equipped. Near Namba, next to the subway, shopping, lots of eateries, entertainment. The only setback is there is no washer. Nice location, big room, clean rooms and staff is very nice. Great location, clean beds/bed sheets, clean room and fair price. The only thing that's missing is a laundry machine and dryer. hehe =) I would come back to this place for another family outing. Σταθμός Υπόγειου Σιδηρόδρομου Nippombashi στα 0.06 χλμ.